I really wanted to get Lumineers. I love the smiles I see in their advertisements. Yet, when I do research on them the reviews are quite mixed. I can’t decide if they are the right brand to get or not. I like the idea of the no prep part. It sounds like it would be better for my teeth. I just don’t want to make a mistake. Any advice? You are sort of on the right track here, but you’re asking the wrong question. 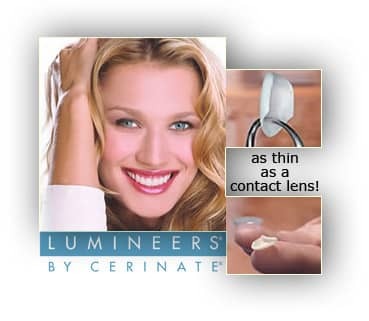 Lumineers are highly marketed, but not just to potential patients. They are marketed even more to inexperienced cosmetic dentists. They tell the dentists they’re easy to place because they can be placed with no tooth preparation. However, that doesn’t always work out best for the patient. No matter how thin something is, you are still adding it to your teeth. Even a millimeter or two will add bulk to your teeth. Depending on your teeth this could end up looking quite bulky. Some disappointed patients have even described them as having horse teeth. Minimal tooth preparation can prevent that. The more important question is who should design your smile makeover, not which brand you should use. Look at it this way. If you hire two artists to do a portrait of the same woman, will they both end up looking exactly the same? Of course not! Each artist has their own style and, quite frankly, one of them is likely more skilled than the other. A great dentist can take any brand and make it beautiful. They just have the training and skills to make beauty. That being said, Lumineers has one big problem— its lab. The DenMat Company, which owns the brand, requires dentists to use their lab. Unfortunately, their lab is known for sub-par work. It is always better if a dentist can pick the ceramist they want to work with. They know their strengths and weaknesses and will know which one will give better results. There are many brands of porcelain veneers, all with different strengths. A skilled cosmetic dentist knows them well. You want that cosmetic dentist. They’ve done significant post-doctoral studies in dental aesthetics. Not only that, but you’ll want them to have an artistic eye with their work as well. It’s nearly impossible for a patient to do all that research. Fortunately, you don’t have to. There is a website called mynewsmile.com. They’ve thoroughly vetted any dentist who wants to be listed on their site. They have to demonstrate both technical skill and an artistic eye. They can’t just pay to get on the site. If you’re looking for a stunning smile makeover, I’d go with one of their recommended dentists. They’ll go over what type of smile design you want, give recommendations based on your facial structure, etc. Then get to work. Trust them to pick the brand. I hope this helps with your conundrum. I’m looking at getting porcelain veneers but I can’t figure out whether to get the traditional or the ultra-thin types. There’s so much conflicting information from the dentists I’ve consulted with. I’m hoping you can give me an unbiased opinion because I live in a different area of the country and you can’t make money off of me. Haha. I’d like to think I’m the type of person who would give you an honest, unbiased opinion even if you were a potential (or current) patient. You are right that there are a variety of opinions on these choices. The reason for that is the different levels of cosmetic experience and expertise between dentists. For instance, a child may tell you the best medium for drawing is a crayon. 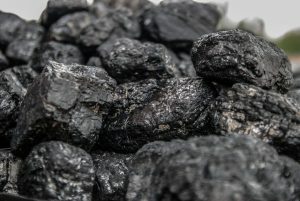 A teenager might say a pencil or colored pencils, and an artist might say charcoal or ink. That’s because they’re all at different levels with that particular art form. That being said, a true artist could get beautiful results with any medium. That’s the key. Not the type of porcelain veneer, but who places them. However, that’s not what you asked. So, first, let’s talk about the main differences between the two types and then I’ll tell you how to find the right dentist. The ultra-thin veneers are (obviously) thinner. This often means that less tooth structure has to be removed in order to place them. 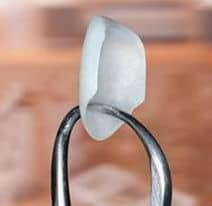 However, to put this in perspective, a traditional porcelain veneer is only a few millimeters thick about 1/2 the depth of a dime. One heavily marketed brand of ultra-thin veneers, Lumineers, claims theirs are so thin they don’t require any tooth preparation. This is rarely true though without the results looking bulkier than patients want. Which you use really depends more on the look you want along with the type of teeth you currently have. An expert cosmetic dentist knows which brands have which strengths and how they’ll effect the smile makeover you want. You want a dentist who has invested in significant cosmetic dentistry training, all of which has to be done on a post-doctoral level. Additionally, they need to have quite a bit of experience so they know how theory works out in reality. Those two requirements are pretty quantifiable. The toughest trait is an artistic eye. They have that special something. Think about two artists doing a painting or a sculpture. Invariably, one artist will just have more skill than the other. This is hard to quantify so you need to get a look at the results of their work. As you can imagine, spending time researching the education and artistry of a dentist is quite time-consuming. That’s why I often recommend patients go to the mynewsmile.com website to find their cosmetic dentist. When a dentist requests to be listed on their site, they do all the research for you. They will only list dentists with exceptional training, skill, and artistry. Any dentist on their list will give you a stunning smile makeover.